Welcome to Toyota of Scranton, a renowned car dealership in Lackawanna County, PA. With our selection of Toyota vehicles, knowledgeable staff and commitment to the community, it's no wonder we're one of the top Toyota dealerships in the Keystone State. If you're interesting in buying or leasing a new car or servicing your current Toyota, come to our Toyota dealership in Scranton, PA! Toyota of Scranton opened in 2007 and has been based in our state-of-the-art facility since 2008. We're known for our massive inventory of vehicles, so don't worry about finding one that satisfies all your wants and needs. If you're looking for a model fresh off the showroom floor, explore our new Toyota inventory, which includes popular models such as the stylish Toyota Camry and the spacious RAV4. Those who are working with a tighter budget may be more interested in our used-Toyota inventory. From gently used cars under $10,000 to Certified Pre-Owned Toyota vehicles, we'll help you find the right car at the right price. 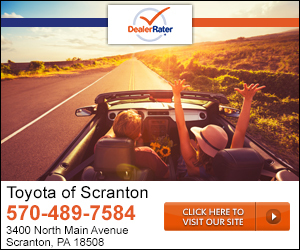 In fact, Toyota of Scranton is the No. 1 certified pre-owned Toyota dealership in Pennsylvania. We even offer auto loans for our CPO vehicles! 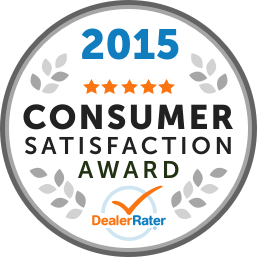 Toyota of Scranton is proud to be a community-driven dealership. We launched a community website that highlights local activities, regularly participate in local events and are active members of Coaches Versus Cancer. We recently donated vehicles and bicycles to the Scranton Police and Fire Departments, in addition to offering a law-enforcement discount. Toyota of Scranton has also won the President's Award several years in a row. Our dealership is conveniently located at 3400 North Main Avenue in Scranton, PA, right off of Interstate 81. That makes us easily accessible from nearby towns such as Wiles-Barre, Clarks Summit and Carbondale. If you're in Lackawanna County and are looking for a new car, come to Toyota of Scranton today! Jake at service desk was friendly and explained all service procedures completely. Price quoted for rear brake job was double what local reputable shops charge. "Getting the breaks back in working condition!" Needed to have the breaks taken care of. They are working great now! Plugged a leaking tire for me also! Good work!! I am glad I can depend on the people at Toyota of Scranton! was able to get a quick appointment for a brake replacement and was very pleased with the response. The service contact "Phil" was very helpful and explained the details clearly and kept me posted on the progress of the work.